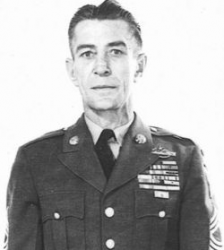 Master Sergeant Thomas Edward McCall (9 May 1916 - 19 September 1965) was a U.S. Army soldier and a recipient of the U.S. military's highest award for valor, the Medal of Honor, for his heroic actions during the Battle of Monte Cassino in World War II. Thomas Edward McCall was born on 9 May 1916 in Burton, KS. He joined the Army from Veedersburg, IN. On 22 January 1944, he was serving as a Staff Sergeant in Company F, 143rd Infantry Regiment, 36th Infantry Division. Near San Angelo, Italy, that day he led his section in the crossing of the Rapido River despite intense German fire. After all his men had been killed or wounded, he single-handedly destroyed two enemy machine gun positions and charged a third before being captured. For his actions, he was awarded the Medal of Honor. 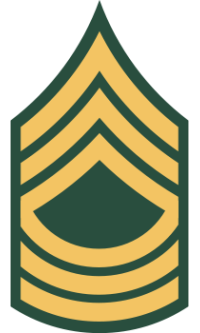 Rank and organization: Staff Sergeant, U.S. Army, Company F, 143d Infantry, 36th Infantry Division. Place and date: Near San Angelo, Italy, 22 January 1944. Citation: For conspicuous gallantry and intrepidity at risk of life above and beyond the call of duty. On 22 January 1944, Company F had the mission of crossing the Rapido River in the vicinity of San Angelo, Italy, and attacking the well-prepared German positions to the west. For the defense of these positions the enemy had prepared a network of machinegun positions covering the terrain to the front with a pattern of withering machinegun fire, and mortar and artillery positions zeroed in on the defilade areas. S/Sgt. McCall commanded a machinegun section that was to provide added fire support for the riflemen. Under cover of darkness, Company F advanced to the river crossing site and under intense enemy mortar, artillery, and machinegun fire crossed an ice-covered bridge which was continually the target for enemy fire. Many casualties occurred on reaching the west side of the river and reorganization was imperative. Exposing himself to the deadly enemy machinegun and small arms fire that swept over the flat terrain, S/Sgt. McCall, with unusual calmness, encouraged and welded his men into an effective fighting unit. He then led them forward across the muddy, exposed terrain. Skillfully he guided his men through a barbed-wire entanglement to reach a road where he personally placed the weapons of his two squads into positions of vantage, covering the battalion's front. A shell landed near one of the positions, wounding the gunner, killing the assistant gunner, and destroying the weapon. Even though enemy shells were falling dangerously near, S/Sgt. McCall crawled across the treacherous terrain and rendered first aid to the wounded man, dragging him into a position of cover with the help of another man. The gunners of the second machinegun had been wounded from the fragments of an enemy shell, leaving S/Sgt. McCall the only remaining member of his machinegun section. Displaying outstanding aggressiveness, he ran forward with the weapon on his hip, reaching a point 30 yards from the enemy, where he fired 2 bursts of fire into the nest, killing or wounding all of the crew and putting the gun out of action. A second machinegun now opened fire upon him and he rushed its position, firing his weapon from the hip, killing 4 of the guncrew. A third machinegun, 50 yards in rear of the first two, was delivering a tremendous volume of fire upon our troops. S/Sgt. McCall spotted its position and valiantly went toward it in the face of overwhelming enemy fire. He was last seen courageously moving forward on the enemy position, firing his machinegun from his hip. S/Sgt. McCall's intrepidity and unhesitating willingness to sacrifice his life exemplify the highest traditions of the Armed Forces. At the time that Thomas Edward McCall left the Army, he had attained the rank of Master Sergeant. Master Sergeant Thomas Edward McCall died on 19 September 1965 at age 49. He is buried at Spring Vale Cemetery in Lafayette, IN, in Section 12, Lot 281.